Our most comprehensive survival training program, covering all aspects of wilderness skills, from herbal medicine to wildlife tracking and outdoor leadership. Runs Sept-May. Learn the core skills of survival in a format that allows you to participate at home and at your own pace. Gain hands-on experience learning the primary skills of wilderness survival in a fun and informative weekend class. Spend five full days immersed in studying outdoor survival skills! 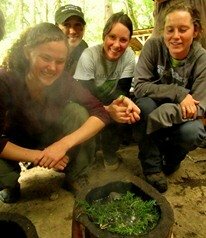 Detailed instruction and ample hands-on experience with shelters, primitive fire, wild edibles, and much more. Learn how to make a wooden long bow. Build and take home a bow, an arrow, and the skills to make more! Learn how to create fire with natural materials! Gain hands-on experience with bow drill, hand drill, and flint & steel. Build a bow drill kit to take home. Participate in six exciting back-to-back weekends of in-depth wilderness survival skills training. Learn cordage and the most useful knots and lashings for wilderness survival shelters, snares, baskets, nets, repairs, and rescues. 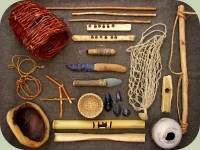 Learn primitive trapping and snaring techniques for emergency survival situations including safety, ethics, placement, and construction. Learn how to use map & compass, as well as aid-less navigation techniques, for traveling on and off-trail in the outdoors. Learn nature awareness skills for survival, including bird language, wildlife tracking, stealth, observation, and camouflage. Learn how to turn common river stones into a variety of survival tools from knives to arrowheads and axes. Alderleaf is able to provide customized wilderness survival training for your group, company, or project. Learn key survival concepts in this two-hour powerpoint slideshow presentation on wilderness survival. Offered at various locations in the Northwest. Contact us for more information. Looking for options in other parts of the world? - Check out Hollowtop's List of Wilderness Survival Training Schools of North America and beyond.